Da5id left his book untended on the table. I picked it up. I read the prologue and I was hooked. How did the kayak get washed up onto the beach? Fortunately for me, David finished the book before he left so I can read it myself. 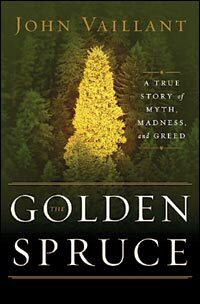 The Golden Spruce: A True Story of Myth, Madness, and Greed written by John Vaillant is a real-life account of K'iid K'iyaas, Elder Spruce Tree, a unique golden-needled sitka spruce more than 200 years old, which was cut down by an environmentalist named Grant Hadwin. 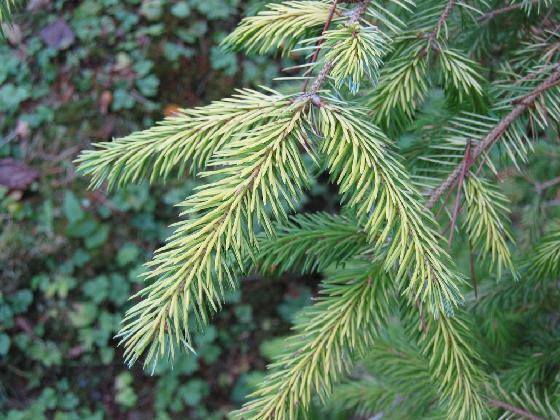 Vaillant doesn't just write the story of this particular tree, he offers a historical overview of the Queen Charlotte Islands , known to their native inhabitants as Haida Gwaii ("Place of the People"), the people who live there, and of trading and logging in the Pacific Northwest. That's as far as I've gotten. I don't know why Hadwin cut down the tree or how the kayak got washed up onto the deserted beach. I grew up in the Pacific Northwest, in particular in a logging community near the Quinalt rainforest (another temperate rainforest link here) on the Olympic peninsula of Washington state, a little farther south than the setting of this book but close enough that I picture the towering trees and the moss and the rain and I feel a little nostalgic for the forested coastal landscape of my childhood. Vaillant's writing is vivid and clear for the most part, a few awkward turns, but very well-done for a first book. Take a few minutes to listen to Vaillant's NPR interview. 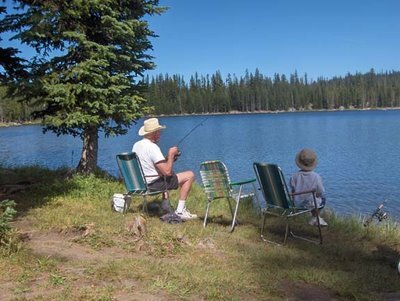 I'm taking a break from The Reformation (MacCulloch), not because I need a break, but because with all of the coming and going and vacation commotion I've not had a lot of time to concentrate. I did read I, Elizabeth by Rosalind Miles. It was a little romance-y and light for my taste, and I found myself rolling my eyes at times, as Miles focuses more on Elizabeth's romances with the young men around her and doesn't give Queen Elizabeth quite enough credit for being a marvelously skilled politician. But it was entertaining, passed the time, and I was able to pick up my train of thought right where I left off whenever I was interrupted. Tomorrow I'm off for the long weekend, this time to Lincoln City. I expect I'll be visiting Robert's Bookshop. Wonder what I'll come home with this time? I went to sleep too late last night, and when I woke up I was really tired. When I got out of bed I stepped on a Hot Wheels. At breakfast I explained what we needed to get done that day and the thirteen year-old argued with me about what we should do. And the five year-old kept interrupting. The eleven year old pouted about having to eat plain old breakfast cereal. After breakfast the thirteen year-old argued with me about the best way to clean the kitchen. The eleven year-old pouted about doing her chores and the one year-old whined to be held and the five year-old fussed about having to get dressed. I said I was getting frustrated. I said I was getting fussy. I said, "If I don't hear some polite voices, my ears are going to fall off." No one even listened. The three year-old said "My tummy hurts." While I was cleaning up the throw-up he threw up some more and the one year-old patted his own fragrant bottom and delightedly proclaimed "Boo-poo" and the eleven year-old couldn't understand why I didn't have the attention or patience to listen to her very important question. When I put the three year-old in the bath, his brother joined him. Fully clothed. "I hope you clean that up," I said. "I hope that the next time you decide to get in the bath you take your clothes off first and they land all the way in the hamper." While I was telling the older boys to clean up the bathroom floor I noticed the toilet was leaking. While I fixed the toilet the baby went into the living room and dumped puffballs all over the floor. While I was getting the dustpan from the kitchen I knocked over my coffee and spilled coffee down the front of my newly cleaned white kitchen cabinets. When we went to the library the one year-old got so angry about the toys that we had to leave because he was crying so hard. When we got home he pitched an even louder and angrier tantrum because I took off his shoes. He doesn't even like wearing shoes. Right in the middle of the tantrum my husband called and told me how wonderful it was walking on St. Andrews golf course at sunset. At lunch, the eleven year-old didn't like the oranges. The five year-old didn't like peach yogurt, he wanted vanilla. We were out of vanilla. The one year-old threw his cheese on the floor and ran away. The three year-old ate his lunch then said, "My tummy hurts." Guess who didn't get lunch? After quiet time the five year-old pestered his sister until she screamed. Then she pestered him until he screamed and while he was trying to punch his sister for pestering him I came up the stairs and he got scolded for hitting and screaming. His sister got sent to her room too. "I am having a terrible, horrible, no good, very bad day," I told everyone. At snack time the girls asked for orange juice. The five year-old wanted milk. The three year-old wanted to drink apple juice. I served them plain old water, but I didn't make them drink it. After snack the three year-old was fine so when he asked for some juice I gave him some. "My tummy hurts," he said five minutes later. They're lucky I didn't box them all up and send them to Australia. 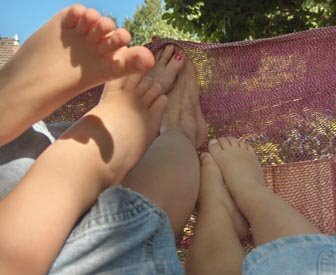 I'm glad I didn't, because at bedtime the girls played quietly and giggled together. The baby snuggled with his favorite book. The five year-old read me a story and the three year-old wanted me to blow good dreams in his ear. I'd miss them if they were in Australia. A young gent's name and I SPY . I spy...the beginning of a new school year. Not the official beginning, of course. It's the "I wanted to start school early but couldn't because we had other plans" beginning of school. We're knocking out a few get-started tasks so that we can sink our teeth into our real first day. Well, as much as you can sink your teeth into wandering around the park and throwing sticks off of a bridge. 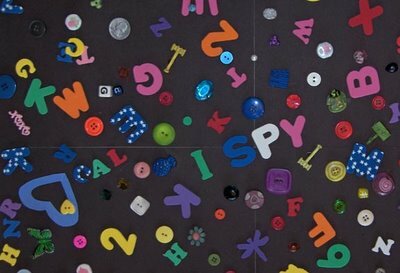 We've voted on our school motto, started on the path to choosing independent studies, and begun our first project, an I Spy book. 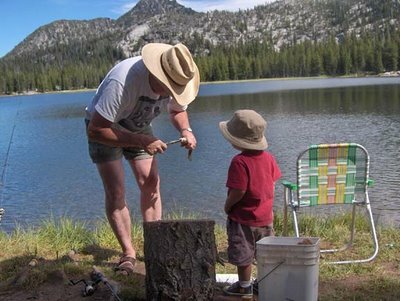 Each child chooses a scene, we all build it. I'll take pictures, and we'll each write our own rhymes for the pictures. One of the fine young gents suggested a picture with beads and letters, simple enough that we could whip it out today without a lot of planning and picture set-up. It was a relaxing way to spend the afternoon and there weren't many buttons and beads on the floor when we finished. The fine young gents wanted I Spy books to read in bed, and a lovely lady was flipping through another while waiting for her sister to join her this evening. Success! Sometimes my suggestion can be the Kiss of Death to a project (or maybe just the Rolling Eyes of Do-We-Have-To?). Today the kids seemed to enjoy putting together the first of five sets, and we're all looking forward to setting up more elaborate scenes. I suspect that a fine young gent has plans that involve his blocks and many many Hot Wheels, as he kept showing me pictures of I Spy puzzles with cars and roads. That will be great fun. I can't wait to see what they each decide to build. Sunwarmed bright Sungold cherry tomatoes. That's true love & homegrown tomatoes. We spent some time out in the garden last night. Weeding, picking, digging in the dirt. Ripe sun-warm cherry tomatoes take me right back to high school when I'd get off the bus and head straight to the cherry tomatoes for an after-school treat. Mmmmm. Sungold cherry tomatoes were an impulse buy in the Year of the Cherry Tomato, about four years ago, when I foolishly decided to plant three different varieties of cherry tomatoes. 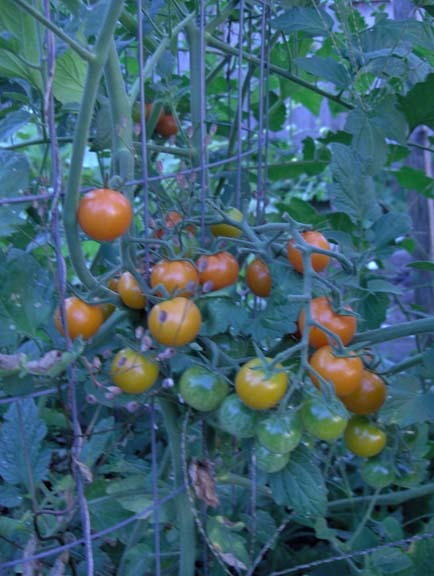 I gave away bowls and bowls of cherry tomatoes that year, and discovered the mild sweetness of the Sungolds. The fine young gents weeded and searched for pumpkins for a bit, then used the hose to make a river. They all got marvelously filthy, enough that I had to hose them down before I put them in the bath. We've been playing "What's that squash?" I didn't chart which squash variety I planted in which hill, and the backyard denizens ate half of the seeds, so we've been guessing what we've got left. Looks like mixed gourds and pumpkins for sure, and something else that I'm not so sure of yet. Alas, no zucchini. 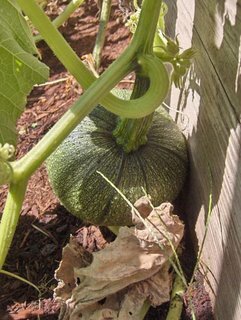 At least we'll have sugar pumpkins for pumpkin scones and Thanksgiving pie. I love having a garden in the back yard. If I were to write a book on gardening, it would be called The Lackadaisical Gardener. It would go something like this: "Plant some seeds. Check for weeds every once in a while. Pick stuff when it's ready." As long as I get tomatoes and pumpkins I'm happy, and I always get tomatoes and pumpkins. This entry reminded me of what you're doing with the Reformation book. The full Scientific American article is definitely worth reading. And worth thinking about. Update on my studies: I am on page 277 of MacCulloch's The Reformation. I've been out in the garden and playing with the ladies and gents instead of reading in the hammock; evenings are full of projects and school planning. That makes for even slower going. New words: trenchant, which means what I thought it meant, and truculent, which didn't. My loving husband: "I'm going to take a shower"--goes upstairs--takes a shower--brushes his teeth--comes back downstairs. ME: "I'm going to take a shower"--get the paper and open the blinds on the way through the living room--notice baby is awake and take him to loving husband in the kitchen--put away the milk that's been left out on the counter--go into the boys' room and set out clean clothes on the boys' beds-- notice their hamper is full, set the hamper at the top of the basement stairs-- go back in the kitchen to tell loving husband that their clothes are out in case he has time to dress them--notice the laundry hamper and take it down to the basement--start a load of laundry--poke my head into the boys' room to ask loving husband to get their teeth brushed too--tell him where the toothpaste is--show him where the toothpaste is--help a fine young gent put on his underwear because he's stuck--go upstairs-- while looking for clean clothes to wear, put away a basket of clean laundry I folded and brought upstairs last night--set a hamper of dirty clothes next to the door--go into the bathroom-- change all the towels for fresh--fix a fine young gent's Lego car and give it back to him--get in the shower-- tell the other young gent to go ask Daddy for some juice because I haven't got any in the shower--look down at the little hand poking through the shower curtain holding the Lego car and sigh--fix the Lego car and get out of the shower to lock the bathroom door--finish my shower--brush my teeth, dry my hair, do all the girlie stuff like lotion--pick up the dirty towels off the bathroom floor and toss them in the hamper by the door--pick up all of the toys that migrated into the bedroom the night before and toss them into the empty laundry basket to be taken downstairs--lug the toys and laundry down the stairs--fix the #$^#$@ Lego car again--and take baby from loving husband because finally, ta-da! I am done with my shower. I feel like a Family Circus cartoon. Seven kids, fifty tickets, four hours. We got home way past bedtime and tucked them in dusty, cotton-candy-sticky, tuckered out. It's sitting there like a big fat squatty toad. Waiting for me to read it. I don't want to read it. Too bad there's not a font called "Whiny" 'cause I need it right now. It's too hard! Waaaaah. Got sidetracked for a minute. "Whiny" didn't look right, so I tried "whiney" which didn't look right either. It turns out both spellings are correct even though neither looks that way. Go figure. Then I came across some whine quotes and got more sidetracked looking at different quotes about whining. On the way there was another little side trip: "Quotations!" I shout at my monitor, then a moment later, chagrined, I apologize to the screen because the M-W Online Dictionary does indeed list quote as a noun as well as a verb. ...which has not much to do with whining and everything to do with what I am whining about, which got me back on track. 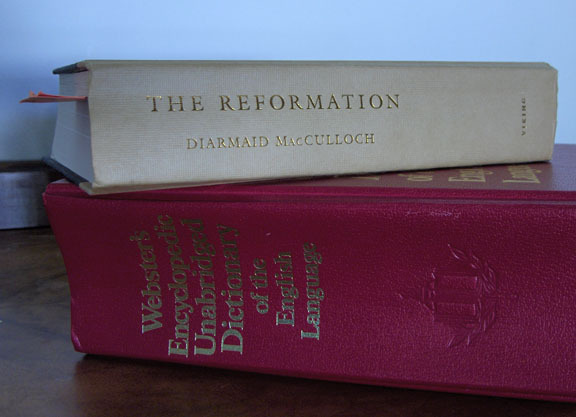 The Reformation: A History by Diarmaid MacCulloch is sitting atop the dictionary for a reason. I am almost 250 pages into this nearly-700 page book, and I've already got two bookmarks full of words. (Though I'll admit that the very bottom of the second bookmark has a couple doodles and the beginnings of my Christmas wish list.) Not just unfamiliar words, there's also a "look up" list: Gnosticism, Thomas Aquinas, Augustine of Hippo, "why was unitarianism considered dangerous?" and so forth. 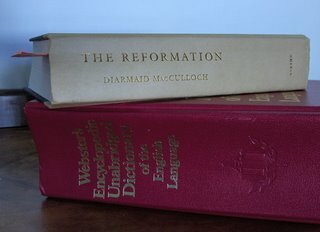 I'm reading a book written with the assumption that the reader has some very basic knowledge about the historical period we call the Reformation or Protestant Reformation, and also based on the assumption that MacCulloch does not need to hold my hand and explain everything for me. (Think how many pages the book would be then!) Thanks to my woefully inadequate education, at least when it comes to world history, the most that I ever learned was something about Martin Luther nailing something to a church door. I'm spending a good chunk of my reading time studying, holding my own hand and searching out my own explanations, which makes getting through the actual book slooooooooooooooow going. I'm done whining now. Here's why: I'm enjoying myself. All of the "In this year this one guy did blah, then another guy did bleh, then so-and-so fought, and there was a war," the dates and names and chronology is dusty plodding for me. But when the story circles back around to the why and the battles over doctrine and the ways that people and politics and history were influenced by new ideas, that's fascinating stuff. I'm learning. It's been a long time since I've really challenged myself this much intellectually. I have to concentrate while reading this book. Sometimes I have to read a passage three times to feel like I really understand the doctrinal differences folks were bickering about and beheading one another over. The fine young gents and lovely ladies, particularly the oldest young lady who's feeling challenged by some of her own schoolwork, see me learning something challenging. Watching me take on a new subject might help them realize that learning is ongoing, that sometimes it's "Let's find out" instead of "This is the way to do it" and "Here are the facts." That's my hope anyway. And a final reason to stop whining: I am nearly 40 years old. Granted, the years between college and the present have been full with work and babies and marriage and autism and school, so it's not as though I've been pointlessly frittering away my time and intellect. But it's time to stop blaming the schools I've attended for what I haven't learned. At some point I've got to let go of the fact that I was never taught whatever knowledge I believe that I'm lacking, and just learn it. Or decide not to learn it, and be okay with that too. So there we have it. Reasons to homeschool, #34 & 35: I get to challenge myself. My children get to see me take responsiblity for my own learning. Someone remind me of how hard this is and how much I've whined in about two months when I am frustrated because the kids don't want to learn about fractions or photosynthesis or, actually, the Reformation, as the looming school year and my complete and utter lack of knowledge about this part of history are what led me to slog my way through this book in the first place. Seriously, remind me. I'll probably say "Oh shut up," but I'll think about it later and secretly admit that you're right. Of course I'll never let you know that. Ever. New words: eschatology, ecumenical, moribund, and my favorite, neologism. Off to read some more. I'll let you know when I finish the darn thing. The fine young three and five year old gents are participating in a sleep study through Oregon Social Learning Center. That's a sleep buddy there in the picture, a wrist puppet with a computer inside that's measuring movement during sleep. The purpose of this study is to measure their sleep patterns and sleep-related hormones in their saliva, which means that I get to collect spit samples in the morning and evening. Nifty! On Friday the puppets were dropped off, along with two very organized notebooks full of instructions and questionnaires and a couple pencil boxes of equipment, mostly gum and stickers. 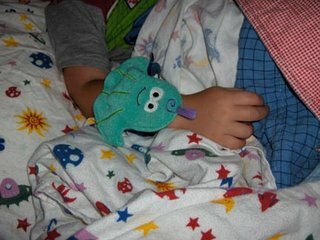 I was concerned that fine young gent, three, would have nothing to do with this sleep buddy business, no matter how cute the puppet. His cool and confident older brother is always up for a new adventure, but the little guy isn't much of one for trying new things. 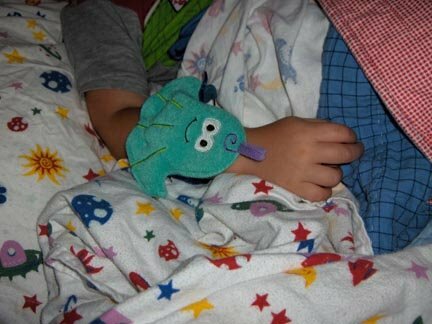 One little peek at the wrist puppet and the matching bath puppet that will be his to keep was all it took. Well, one little peek and then....having to wait two whole days to actually wear the puppet. And my guys? More excited that there's a computer inside than they are about the cutesy little fish and octopus. Yup, they're their daddy's boys through and through. Now if only I can get them to chew on a piece of cotton before breakfast...we'll see how that goes over. 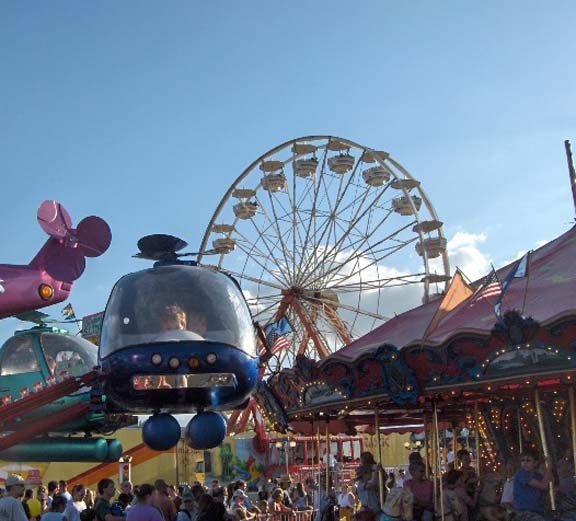 After five nights with the wrist computers, three days of saliva samples, and several questionnaires, the young gents will come away with a cool pencil box and the rest of the gum inside, a bath puppet, and fifty dollars each. 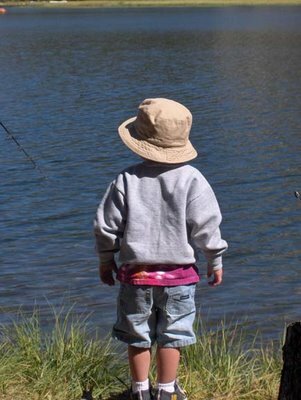 If you're in the Eugene-Springfield area and have or know a child between three and six who might like a bath puppet, a cool pencil box with gum, and fifty dollars the researcher who set us up for the study says that they are still recruiting families for this project. You can call OSLC at 485-2711 and let them know you're interested in participating in the sleep study. It's Robot Week. 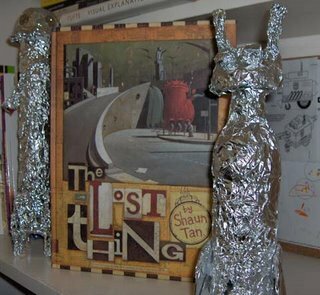 While not exactly a robot book, The Lost Thing by Shaun Tan has some interesting contraptions and has been a favorite in our house since Grandma & Grandpa K sent it our way. The Lost Thing is a story about noticing (or missing) the out-of-the-ordinary. The text is fun to read aloud and the illustrations are detailed and unusual. The oldest young gent likes to take it to bed at night and study the details. We'd love to see this book as a movie. We'll be looking for more of Tan's books at the library. Another robot favorite? Benjamin McFadden and the Robot Babysitter, a story about the night Benjamin McFadden reprograms his robot babysitter for a night of FUN! The fine young gents love this book. Looks like it's out of print, but you might be able to find it at the library. We made our own robots. It was great fun rummaging through the recycle box to find pieces. We've got a robot made from a paper towel roll with clothespin legs, a water bottle robot with golf tees for antennae, and a robot made from a box with a yogurt container head and Odwalla smoothie bottles for arms and legs. 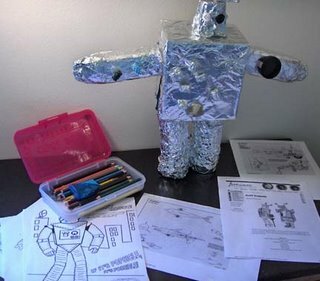 I found the coolest robot coloring pages. The guys had fun looking at them and imagining what a dolphin robot might do. The lovely ladies are reading away too, as always. The oldest is working her way down her summer reading list, reading through the last chapters of The Shining Company by Rosemary Sutcliff. Rosemary Sutcliff was a prolific author of historical fiction for children. (Oooooo, prolific is fun to say. Prolific, prolific, prolific...it'll help get "curmudgeon with a bludgeon" out of my head. Thanks a lot, Mom.) At any rate, our introduction to Sutcliff's writing was last fall when I chose Black Ships Before Troy: The Story of the Iliad to read out loud. We were enthralled. Riveted. Sutcliff's retelling of The Iliad is vivid, compelling, fascinating. It was a pleasure to read aloud. Since then, other Sutcliff books made it onto this lovely lady's independent reading list: The Wanderings of Odysseus: The Story of the Odyssey, and The Eagle of the Ninth. She was excited to see a Sutcliff book on her summer reading list. What better recommendation do we need? Lovely lady number two is still reading Betsy-Tacy series, with a new book waiting in the wings: Julep O'Toole: Confessions of a Middle Child, a birthday treat she chose with a gift certificate. It remains to be seen whether Julep can hold her own against my daughter's current reading obsessions, but the outlook is good. Julep has an older sister and an annoying younger brother, and she desperately wants to be popular, themes that this lovely young lady seems to identify with. We'll see if she starts spouting Julep-isms over the next few weeks. My fabulous husband is reading another golf book. I told him if he ever reads about, well, just about anything but golf, I'd be happy to blog his books too. I'm sure it was a struggle for him to contain his enthusiasm at the idea. Or maybe he was trying not to laugh because I just used the word blog as a verb. I'll bet he's gleefully browsing online bookstores right now, looking for the right book to read. I'm reading a book on the Reformation. I'm sure that you're all as riveted by the topic as I am. If you want to know a bit more, click here for an overview. I am only 200 pages into the nearly 700 page book (not counting the appendices). In a few moments, I plan to go read the book instead of writing about reading it. Discombobulated again, because I am actually sitting at my desk saying "Discombobulated." Out loud, more than once. Singing it, even. (Try it before you judge.) My husband just looked at me as though thinking he might ask what I'm doing, but he seems to have reconsidered. Wise man.